The big battle all weekend was between Mackrell and the Supaloc Racing Lamborghini Gallardo Superleggera of Kevin Weeks, now sporting a fresh twin turbo setup. Weeks was still a fraction off Mackrell’s times, but the noise of the forced induction Italian V10 outclassed the 260Z in every way. It was spine tingling and worth coming just to listen to it alone. … and Luke Bosman in his classic Bayside Blue R34 GTR. In yet another committed performance, Chris Edmondson was once again pushing above his weight to claim second place outright 2WD in his street trim Nissan 180SX. This little red rocket doesn’t look as wild and sounds quite mild, but there is nothing subtle about the way Chris punts it up the hill. 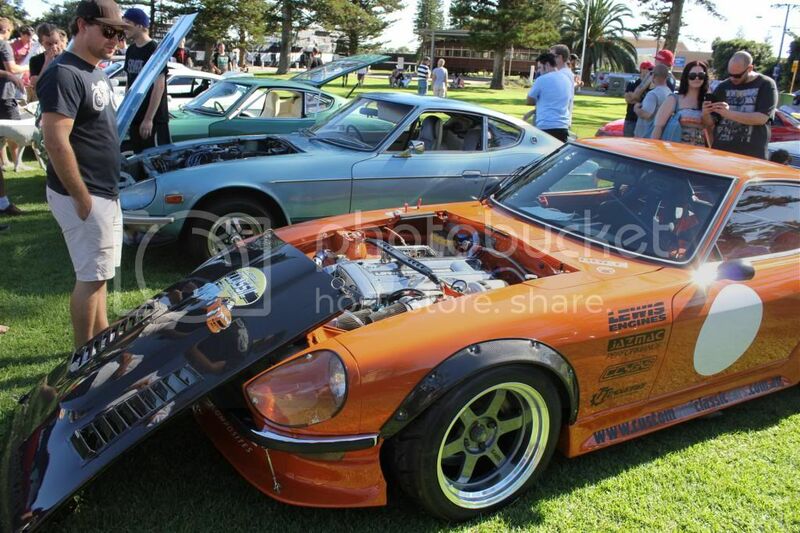 … and Paul Henshaw’s 1971 Datsun 240Z. I don’t know what resides under the bonnet of this car but I can assure you it didn’t come from the Nissan factory in the early 70’s, and I suspect it now has RB power. The popular closed-road course was unchanged for 2014, and its one mile (1.6km) of twisting tarmac lays claim to being the fastest hillclimb in Australia; the perfect place to fully test the ever increasing speed of competition. Speed in both senses of the word, the first being the track record. With perfect track conditions found in the cool but sunny days and a heavily revised aero setup, Mackrell smashed his own record by setting a 39.502sec pass on his fourth official run. Speed also in terms of top speed achieved. Competitors have broken 200km/h across the top of the hill before, but for this year a new speed trap was added at the 200m mark, measuring acceleration off the start line. The double entered Willall WR1000 R35 GTR of Kier and Kurt Wilson was clocked at 189.89km/h at the 200m mark, which is staggering speed for a street registered car. That’s 0-190 in 200m, uphill, on loose tarmac. Awesome. In addition to being the fastest hillclimb, Mount Alma surely has to be one of the most beautiful. This is the view from the start line area looking back to the literally termed competitor paddock, nestled with lakeside views. The soft grass is ideal for camping, and on the Saturday night many competitors simply pitched the tent next to their competition cars and slept the night. There’s something so ‘right’ about arriving early to a motorsport event and seeing people camping out – it really adds to the atmosphere. It was very cold, but as the sun slowly peeked its rays through the trees it struck me just how lucky we are to be able to race in such a lovely setting. It was also a good chance to get up close and have a look at some of the cars. The Supaloc team were yet to arrive, so sadly the new twin turbo setup on the Gallardo remained hidden under the carbon engine cover. … and an ideal place for volunteers from the Variety Club to stoke up the barbeque and cater for the hungry spectators and competitors. As you pull up to the start line you’ll receive a smart joke from commentator Damo before you are lined up and given the 30 second countdown. After the uphill sprint through the 200m speed trap, competitors find themselves approaching turn one at a rapid rate. It appears a relatively basic corner, but with the excitement of the straight line drag it is easy to enter too fast with cold tyres. … but the same unfortunately can’t be said of the right rear suspension, which copped a rather large hit from a disused concrete road sign base and ended up a broken mess, knotted in tangled fencing wire. Turn two is a long right-hander that seemingly goes around and around forever, and whilst being the slowest natural corner it is the easiest to mess up. You need to carry good speed around turn two to find the speed for a fast run, but a little too much momentum and you can spin inwards and clip a bollard – a five second penalty. If you loose the rear end and spin toward the outside, you might be lucky and not collect a bollard. Time will be lost, but nothing more serious than that. The natural progression is understeer – even this bloke is giving himself the thumbs down as he spears off into the dust! There are a few empty barriers waiting for you on the outside, but nothing more serious than that. Turn two is an ideal spot for the drifters, as its constant radius and uphill exit seemingly invites some tail-happy action. Not to mention the constant supply of spectators, all cheering for a little bit of sideways showboating. But no, the key to a quick time is a smooth exit that maintains as much speed as possible, which is especially crucial in a lower powered car. Mount Alma is at its steepest right here, and is a challenge to all but the fastest cars. It’s a serious task even walking up this part, and many spectators never make it past turn two. Some spectators just find the closest fence post, and collapse and die. At this point it’s hard work going either up or down, so you might as well just find somewhere and take a nap. … before the mad braking exercise for the chicane. This is an area where not a huge amount of time can be gained, but it can very easily be lost. Each one of those bollards is a five second penalty, even if you just slightly touch it. This was a little more obvious, and I doubt this penalty was disputed. A good exit from the chicane sets you up for the second half of the run, where the character of the road changes somewhat. It’s all about top speed here, and it is in this part of the track where it’s won and lost. The incline levels out and the following left/left/right/left/right sweepers are seriously big balls stuff – it’s here that the fast cars top 200km/h. Accidents up here are rare, but they are usually monumentally huge when they do happen. Andrew Weber in his LS3 powered Ultra was very lucky to get away with this one with little more than a broken front splitter and mouth full of dirt. What a wild ride! Only the hardiest of spectators venture up this far, and with the howling wind it can get pretty lonely. But that’s okay, there’s always the expansive vista and ever-friendly sheep to keep you company! After a short straight you break the timing beam at the finish line, and need to jump on the picks quick smart for the sharp right-hand bend and gravel transition that follows. If you’re on the money it will have taken around the mid 40 seconds, and you’ll be sitting back pondering just how much faster you could have gone if you didn’t chicken out and lift. One man who didn’t chicken out and lift was Jake Jones, aka Drift Squid, who came out in his immaculately prepared RB powered 180SX to give some drift demonstration runs up the mount. Despite his young age, Jake’s drifting career has taken him as far as competing for Team Orange in the D1GP event in Tokyo. At the recent Top Gear Festival at Sydney Motorsport Park he was almost set to take Daniel Ricciardo for a lap when Dan’s PR people caught wind of the plan and stepped in to stop it. Jake had to settle for a signed dash, which is still pretty cool. His runs were uniformly wild, producing bulk amounts of smoke the whole way up the mount. It takes huge power to make that much smoke, and it was pretty spectacular to watch. I’m told that even Kevin Weeks was impressed. Sebastian Lip had a tough weekend in his AMS Alpha 12 powered R35 GTR. Bigger turbos had been fitted for top speed purposes at a recent standing mile event which required a slightly different driving style. His unlucky weekend peaked when the shaft that drives the front wheels in the gearbox snapped, leaving him with only rear wheel drive for most of Sunday. It’s a known problem in R35’s and will be fixed before the upcoming Windy Point Hillclimb, but it was a frustrating return to Alma for the past outright winner. Legend of the Lakes Hillclimb winner Peter Gazzard only came to Mount Alma for a look, however on Sunday morning Seb convinced him to have a go in the AMG G63 that Any Given Reason drove a few months ago. The tools were emptied out of the back and a windscreen banner applied and Hey Presto, racecar! The result was pretty much as expected – the big Merc was devastatingly quick in the straights and up the hill, but shall we say, less than suited, in the corners. Funnily enough it wasn’t the only off-roader competing on the weekend, with Shannon Duce surprising more than a few people in the Jeep Grand Cherokee SRT-8. Daniel Deleur and Jeff McDonald had their latest creation out – the Festicle. Built to tackle the upcoming Shitbox Rally to raise money for cancer research by driving from Perth to Darwin via the Kimberley, the six-wheeler Festiva (Tyrell inspired?) gave demo runs up the mount all weekend and it was a massive hit. You can cruise to their Everyday Hero page and make a donation here. City Holden kindly provided a new HSV Clubsport for use as a course car, and I can guarantee from observation that neither Andrew Admiraal nor Michael Clements had a scrap of fun driving this up the hill all weekend. Not a single smile or laugh was heard. Not at all. Being the first event since the end of daylight savings, darkness fell just as the final top 3 shootout runs were happening. It was a little tiring for all but it still felt right – when you’ve got a road like this as your disposal, you want to make sure everyone gets the maximum number of runs! As the trophies were presented and champagne was sprayed, it was a momentous and relaxing moment for the podium finishers. But such is the level of competition at Mount Alma that a lot of people who didn’t make the podium will be going back to the drawing board; back to the sheds and workshops of Adelaide to figure out how to get that little bit of extra speed for next year. Watch this space. Words and photos by Andrew Coles. Additional high-res, unwatermarked photos of most competitors are available for purchase in high res. Email andrew@anygivenreason.com for samples and pricing. This entry was posted in Motorsport and tagged 180SX, 260Z, A45, AMG, Clubsport, Datsun, Drift, Drift Squid, Elise, Festicle, G63, Gallardo, GTR, Hillclimb, HSV, Jake Jones, Kevin Mackrell, Kevin Weeks, Lamborghini, Lotus, Mazda, Mount Alma Mile, Mt Alma, Pilatus, Porsche, R35, RX7, SDCC, Shitbox Rally, Subaru, Supaloc Racing, Turbo, Ultra, UME, Willall by Andrew Coles. Bookmark the permalink. It’s actually a sonvia, 180 front bar and quarters, Silvia bonet and body.